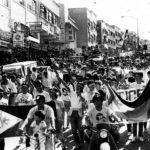 →What Martial Law was like? What Martial Law was like? In 1972 Ferdinand Marcos declared Martial Law with Proclamation 1081. He did it, he said, to save the Republic and to create what he called a “New Society.” A whole generation of Filipinos now exists which only has the faintest recollection — if at all — of the Marcos dictatorship. Kids, this is what you missed. Perhaps it’s what you should pass on when you have kids of your own. The lies. The biggest lie — the mother lie — was that Martial Law was imposed for the good of the people. It was not. It was imposed for the good of the Marcoses and their cronies, to keep them in wealth and unassailable power forever and ever amen. Marcos was a congenital liar: he lied about the state of emergency. He lied about his ill-gotten wealth (“what ill-gotten wealth?”, he would ask amusedly.”Tell you what, if you can find it we’ll split it”. Shows how reliable his word was). He lied about his war medals (almost all of them were fake), he lied about his father’s wartime heroics (it turned out Marcos Sr was a collaborator executed by the guerrillas), he lied about his health. He lied about holding free elections and dismantling Martial Law. He lied and lied and lied. This was the man Joseph Estrada wanted to give a hero’s burial. The fear. Anybody could be picked up at anytime for any reason by the military or the police. You could wind up a detainee, or you could just vanish, a “salvage” victim. If you protested against the government, you were labeled a “subversive” or a “communist” or both and you were summarily arrested. People the government didn’t like were tailed by security elements, their telephones tapped. A student who spoke up to Imee Marcos was murdered. No two words were more invoked and abused for the purposes of oppression than “national security.” People were afraid to speak out. Marcos logic being what it was, the silence meant the people were happy. The injustice. Only Marcos and his cronies, who plundered the economy, were protected by the law. Nobody else was. Arbitrary arrest, detention, salvaging and torture were the standard. The Defense Minister — a man named Juan Ponce Enrile — said in 1982: “We presume that priests and nuns charged with subversive activities are guilty until the courts decide whether they are guilty or not.” On one occasion the Chief Justice of the Supreme Court, someone named Enrique Fernando, servilely held an umbrella over Imelda Marcos’ head. The censorship. It was only when rebel soldiers finally seized a TV station in the EDSA uprising that people saw in their sets just how big the crowds were. Up until then the media were strictly controlled. Journalists who wrote against the regime — most of them were women — were routinely “invited” for questioning by the military. There was no transparency whatever. There were only three national broadsheets, the Times Journal, the Daily Express and the Bulletin Today, all of them offering the same pro-administration pap. 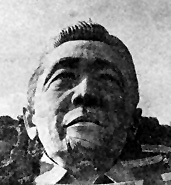 The chief Marcos mouthpiece was a columnist named Teodoro Valencia. He died in 1986 and is now considered the “dean” of Philippine journalism. In 1983, when Ninoy Aquino was buried, at least one million people accompanied the funeral cortege as it wound its way through Manila. The next day, the Bulletin scarcely mentioned the story, instead playing up a story about a man struck and killed by lightning at the Luneta Park. (Recently, Joseph Estrada extolled the Bulletin as his idea of a good newspaper). The poverty. Poverty increased from 24% in 1974 to 40% in 1980 and why not? Imelda Marcos was using the Philippine National Bank as her private piggy bank. One of her ideas of dealing with the poor was to put up whitewashed walls around the squatter areas in Manila. The walls are still there. The corruption. There were suspicions about the Marcoses dipping into the public till. After EDSA, dazed investigators realized that the truth far outstripped the suspicions. The Marcoses had been screwing the public even before Martial Law. As early as 1968 Ferdinand and Imelda had already salted away more than $900,000 in Zurich accounts under the names “William Saunders” and “Jane Ryan.” It was the initial deposit in what would turn out to be a mountain of loot. After having tracked down Marcos accounts and properties all over the world, investigators still aren’t sure that they’ve found all the ill-gotten wealth. Imelda Marcos speeches. They were terrible and they dragged on interminably. Among the things she said publicly: The Philippines is the center of the world, because that’s the way it looks in a map. There’s a cosmic hole in the Universe which shines radiation in the Philippines which Filipinos can tap to deflect intercontinental ballistic missiles. Her audience would applaud frantically. Cowards cheering a loony. The arrogance of those in power. It was called a “smiling dictatorship” but the only one who was smiling was the dictator. Actually, his friends and family were also happy. When his cronies got into business trouble they were bailed out with taxpayers’ money. No investigations into cartels and monopolies were allowed. Marcos “lifted” Martial Law in 1981 but continued to rule by decree. Later it was discovered he had signed dozens and dozens of secret decrees which he intended to flash at the appropriate occasions. During the 1986 snap election when an opposition official said that there had been cheating an election commissioner — his name was Jaime Opinion — sneered at him on TV and snapped, “that’s a lie!” repeatedly. After EDSA Opinion went into hiding. When EDSA was in full swing, a rebel helicopter attacked the Palace with rockets. Marcos went on air and said “my family cowers in the Palace.” He didn’t get any outpouring of sympathy.